Well, I didn't have any luck on the horses this Melbourne Cup, but I did find a trifecta of horse-themed goodies to lift the spirits! 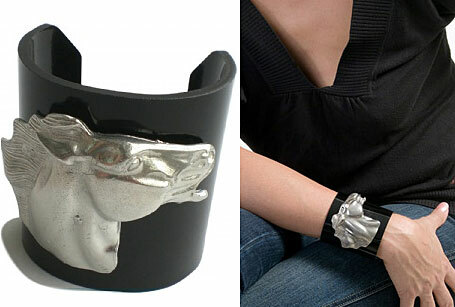 The Stallion Cuff (above, AUD $78) from Fuzz Design Workshop is bold & beautiful. Made from cast pewter and formed acrylic, this galloper can certainly make the distance. 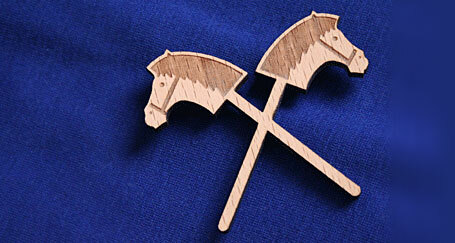 The etched wooden Hobby Horse brooch pictured above is from popular local label Allira (AUD $35). This young filly shows talent (and a lovely wood grain) but may have trouble finding direction! 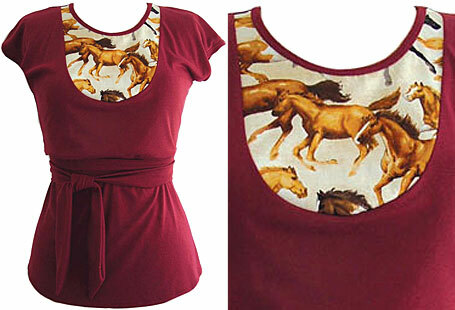 In third place is this burgundy bib top from Secret Squirrel Clothing featuring a stampede of brumbies on the front. A fine finish with optional belt detail. It is available for online purchase from YTBA for AUD $80.